Fits all H, I4, O4 & W4 series except supers. Includes parts shown in picture above. Note: For reassembly purposes only, instruction sheet depicts parts that are not included in this kit. Make sure to find your carburetor manufacturer number in the list above. If your number is not in this list, this kit is not the correct kit for your application. Includes parts shown in picture. Instruction sheet and diagram show additional parts for reassembly purposes only. 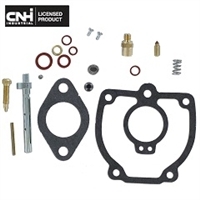 This kit includes the throttle shaft (3.314" length), needle and seat, float lever pin, choke and throttle shaft seal, needle valve, idle adjustment screw with graphite packing, friction ball, gaskets and instructions. Fits the listed carburetors, please make sure your carburetor number is on the list. New, universal Zenith replacement. External appearance may vary form original carburetor. Throttle Shaft Length = 4.88"
For some applications you may need to trim the length of the throttle shaft to clear the block or reuse old throttle / choke linkage. Please make sure you have clean fuel. If your tank is rusting then this will contaminate your fuel. If your fuel is contaminated, you cannot fix the problem with a new carburetor. Carburetors are limited to replacement only, no refunds. No replacement will be given if rust, dirt, etc. is found in the carburetor or if it has been taken apart.